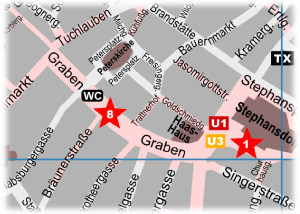 You can find the public toilets in the Vienna center marked in the city-walks map with a "WC" symbol. Additionally you can find also public toilets in most of the metro stations in the inner city of Vienna. You have to pay in the most cases approx. 0,50 Euro for the use. Unfortunately the opening hours are not standardized, but most of the toilets are open during the day between 9:00 and 18:00 o'clock. In some metro stations in the center of Vienna the public toilets are open 24 hours a day.